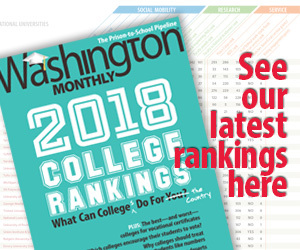 Washington Monthly | Is Obama Really Serious About Reducing Standardized Testing? Is Obama Really Serious About Reducing Standardized Testing? President Barack Obama on Saturday called for capping standardized testing at 2 percent of classroom time and said the government shares responsibility for turning tests into the be-all and end-all of American schools. Students spend about 20 to 25 hours a school year taking standardized tests, according to a study of the nation’s 66 largest school districts that was released Saturday by the Council of Great City Schools. But it’s not known how much class time students spend preparing for tests that became mandatory, starting in third grade, under the George W. Bush-era No Child Left Behind law and are a flashpoint in the debate over the Common Core academic standards. To drive the point home, Obama and Education Secretary Arne Duncan plan an Oval Office meeting Monday with teachers and school officials working to reduce testing time. In all, between pre-K and 12th grade, students take about 112 standardized exams, according to the council report. It said testing amounts to 2.3 percent of classroom time for the average eighth-grader. And then Arne Duncan resigned. It’s nice to say that policymakers “share responsibility for turning tests into the be-all and end-all of American schools,” but actually it’s more accurate to say this is pretty much entirely government’s fault. That meeting with teachers is pretty unlikely to have much impact. The trouble with this line of thinking is that federal policy drives much of the increase in standardized testing. Under the Obama administration, testing has actually been emphasized. It was a requirement for states who wanted to compete for awards under the Race to the Top campaign. And outgoing Education Secretary Arne Duncan used to urge states to develop rigorous assessments — and even offered federal money to assist them. Now, after nearly everyone — from school districts to federal and state lawmakers, as well as teachers and parents — had concluded that the emphasis on testing sometimes went too far, the president has declared it true, too. It’s true that America’s schools and school districts could have implemented the president’s Race to the Top program–which incentivized states to adopt performance-based evaluations for teachers, implement common standards, expand charter schools, and build data systems to track school performance–in ways that didn’t increase the amount of standardized testing. They could have created good tests that were high quality enough that they could be administered once a year and take only three days to administer and be used for student evaluation and state and federal mandates, and maybe even to measure teacher quality. Such wonderful tests are actually even in development. But the president’s experience with American domestic policy, not to mention a vast army of Education Department bureaucrats with decades of experience dealing with American schools, ought to have demonstrated that there was no way that was going to happen unless they managed to craft federal policy differently. Obama directed the Education Department to make it easier for states to satisfy federal testing mandates, and he urged states and districts to use factors beyond testing to assess student performance. The problem with this is that as long as standardized tests are allowed, schools are mostly going to use them. That’s because standardized testing is the cheapest and most convenient way to assess student learning, even though it’s miserable for students and doesn’t really provide much useful information about how students are learning. The federal government does not control education in America, but due to a complicated system of education grants; it exerts tremendous control over American education. If you’re going to complain about this problem, Mr. President, you’re really going to have to actually figure out away to try to fix it. We’re going to have to provide an incentive for schools and districts to use less standardize testing, or punish them for continuing to evaluate that way. The buck, as they say, stops with you.